Melanie D. Fenwick Thompson is a native of Baltimore, Maryland. She attended Bucknell University and received her Bachelor’s degree in International Relations with a minor in Dance. She is a member of Alpha Kappa Alpha Sorority, Incorporated, since 1994. After playing Division I basketball at Bucknell for one season, she was then accepted into the dance program. Melanie worked in corporate America for two years and entered the University of Baltimore, School of Law in 1996. In 1999, Melanie graduated from law school and accepted a position as an Associate Lawyer with the Law Offices of Monica E. Ewing (“MEE”), an Entertainment Law firm. Entertainment Law was approximately 95% of MEE’s practice area, which allowed Melanie to gain a wealth of experience in filing trademarks and copyrights, negotiating and drafting recording agreements, producer agreements, management agreements and a host of other entertainment-related agreements. In January, 2004, Fenwick Thompson & Associates opened in Downtown Decatur and the practice areas was expanded to include Family and Juvenile Law. In Family Law related matters, Melanie represents mothers and fathers in custody, divorce, child support, modifications of exiting Orders and other domestic related matters. As a Juvenile Law Practitioner, Melanie focuses on reunification of families once DHR has removed a child from the home; protecting the rights of parents or legal guardians and children. In some cases, Melanie has represented grandparents seeking to exercise visitation rights or custody. Although the outcome in any case can never be guaranteed, Melanie’s commitment to each case is met with sensitivity and legal expertise. 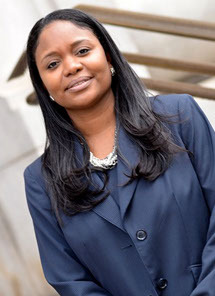 In 2007, Melanie was appointed by Judge Vincent C. Crawford to facilitate and approve new attorneys for the DeKalb County Juvenile Court appointed list. Melanie is a resource for these new attorneys transitioning into private practice by providing guidance, advice on cases, and law firm management. Melanie has a wealth of legal expertise to offer her clients but she is also personable in her approach to family and entertainment clients. As a wife and mother, Melanie can relate to personal family issues. Melanie is a member of the R. L. Norton Elementary School PTA and has coached her son’s basketball teams. As for her personal experience in the entertainment industry, Melanie participated in local fashion runway and hair shows and she was cast as an extra in Baltimore-based television series and movies, “Homicide” and “Hairspray”. During her years as an Associate Lawyer, Melanie continued modeling and dancing in Atlanta. Eventually, she was featured in a full page print ad in a nationally recognized hair magazine. Melanie strives to empower individuals and colleagues through her passion for law and stressing the importance of, “People First”. The latest forum for Melanie to share this passion for law will begin on November 21, 2009, and continue every 3rd Saturday of the month from 1:00-2:00 p.m. Melanie will appear as a guest on the “Sister’s Law Talk” radio talk series on Channel 1380 AM. Join Melanie while she addresses Family Law related questions on 1380 AM and online at www.waok.com, where the show will air live.